Tucked away at the feet of lush, green hills on the northwest coast of Cephalonia (‘Kefalonia’ in Greek), the crescent-shaped Myrtos Beach holds its reign as one of the most beautiful beaches in the Greek Islands. With crystal-clear waters, steep limestone cliffs, and white pebble shores, the beach is one of the most photographed in the world. Spend a summer day soaking in the rays and scenic surroundings, or plan a visit for late afternoon to catch a glorious sunset over the horizon. In addition to handy amenities like lounge chairs for rent and a beach shack for refreshments, the Blue Flag-awarded beach is internationally recognized for its excellent water quality and clean coasts—just one more reason to get your feet wet. To get the most out of your Cephalonia beach day, combine a trip to Myrtos Beach with a guided boat tour of the underground Melissani Lake, available as a day trip departing from Zakynthos and Argostolion. Myrtos Beach is located in Pylaros, Cephalonia. Access to the beach is down a 1.25-mile (2-km) rough track from the village of Dibarata via a series of sharp hairpin bends. Drive cautiously down to the car park or walk down (there’s a store at the top of the track that sells water). Take good footwear. The beach can be affected by strong winds—normally during the middle of the day—and the current can become too strong for swimming. A lifeguard is always on duty in the summer. Discover all the wonder and amazement on Kefalonia Island, a well-preserved, unspoiled paradise on this guided day trip. Take in the deep blue sea, historic monasteries, wineries and quiet fishing villages as you learn about the history and culture of the island. Immerse yourself in the Kefalonian countryside with this scenic drive meandering along the stunning seaside and pausing to linger in rustic gorgeous villages, some of which survived the great earthquake of 1953. Take a boat ride on Melissani Lake, explore the Drogarati Caves, and taste local wines. Soak in the scenery and culture of Zakynthos' neighboring Greek island of Kefalonia on this day trip. After a ferry ride from Zakynthos, enjoy an island bus tour with stops at highlights like the Drogarati Caves and Myrtos Beach, plus a boat ride on Melissani Underground Lake. Finish with time in the capital, Argostoli, before your return ferry transfer. Central pickup and drop-off at Zakynthos resorts included, with entrance fees and lunch at own expense. Take a plunge into the Greek underworld -- literally -- with this guided boat tour of the underground lake Melissani. 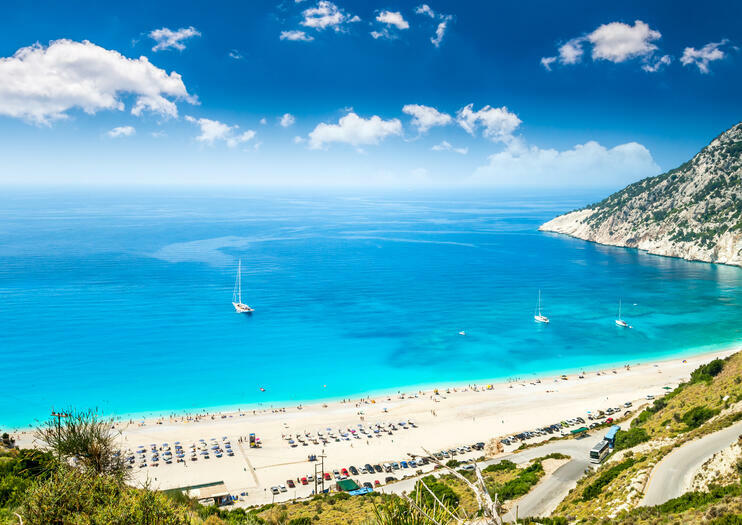 Then drink in the amazing turquoise waters of Myrtos Beach, one of the most photographed beaches in the world. Moving through the mount of Ainos we will explore the most representative attractions of the island. We will learn about the culture of this island, will taste local products, will travel at unique nature sceneries and take photos of the landmarks of the island. This is a private tour and can be fully customized according to your needs. No lines, no wait for others ! Luxury minivan with professional English speaking driver will be at your services.The duration of the tour is about 5 hours.